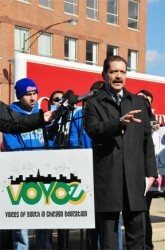 Student speakers from VOYCE, a youth-led education reform organization, and elected officials including Cook County Commissioner Jesus Chuy Garcia, State Senator Willie Delgado, and State Representative Kim Dubuclet, called on Mayor Emanuel to end extreme school discipline practices that are forcing Black and Latino youth out of school and onto the streets. Ninety-four percent of all disciplinary actions issued were for offenses that did not pose a serious and immediate threat to safety. Chicago students lost 306,731 days of school last year as a result of these actions.